Have you ever heard of a kappa? Found in Japanese folklore, these turtle-like creatures usually inhabit rivers and streams, but occasionally they venture out to trade with humans for their favorite snack: cucumbers. Perhaps you’re more familiar with leprechauns, mischievous beings found in Irish folktales who guard pots of treasure and grant wishes if caught. 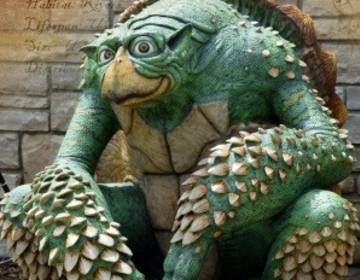 A Kappa and a leprechaun, as well as goblins, trolls, and other fantastic folk will take up temporary residence in the Huntsville Botanical Garden on June 1st as part of the Gardens of Myth exhibit. This series of sculptures, handmade and painted by Kendall R. Hart, are sure to delight visitors of all ages. Ranging in size from the tiniest fairies to an impressive 25-foot dragon, each piece is accompanied by a sign detailing interesting facts about the creatures, including country or region of origin, habitat, lifespan, and character. Hart, an award-winning sculptor, painter, illustrator, and graphic and web designer, specializes in the sculpture of life-size creatures. Inspired by fantasy and surrealism, his art and design can be found in graphic novels, websites, major haunted attractions, natural history museums, private collections, and, of course, botanical gardens. Gardens of Myth will be on display at the Huntsville Botanical Garden from June 1 to October 31.